In the morning on August 24th, Cái Răng district People’s Committee coordinated with Cần Thơ Newspaper to commence ceremony to offer scholarships, bikes and learning utensils to good but poor pupils at the beginning of 2016-2017 school-year. Offer scholarship and bikes to pupils. 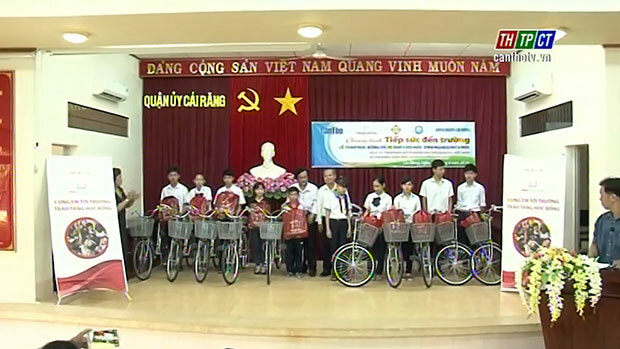 20 good but poor students from primary and junior secondary schools throughout the district received 10 scholarships, VND 1 million each, and 10 bikes, VND 1.2 billion each, totaling VND 42 million, sponsored by Cần Thơ Lottery One-member limited liability Company, Life Insurance – Prudential Vietnam and Tài Vân Shoe Shop in Ô Môn district./.